Hilde Devolder owns a chocolate shop in Ghent, Belgium, where she produces fine pralines and sells several Single Origin chocolates produced by a carefully selected selection of top bean-to-bar companies. But she also produces several 100% chocolate bars in her workshop. As a base, she use Luker cacao. Luker is a Colombia based cacao company that recently opened a branch in Belgium to strengthen their international position. Luker produces “Cacao fino di aroma”, or “fine or flavor” cacao beans as indicated by the International Cacao Organisation. Fino di aroma cacao usually means criollo or Trinitario beans. Bulk chocolate as many people know the best, is made out of the more resistent yet les flavorful Forastero beans. Only about 8% of the world’s cacao production is considered “Fino di Aroma”. And exactly this cacao makes fine chocolate stand out way above its supermarket bulk nephew. I was eager to try one of Hildes bars, so I picked out the Colombia 100%, mostly because I didn’t encounter any other Colombian origin chocolate so far. 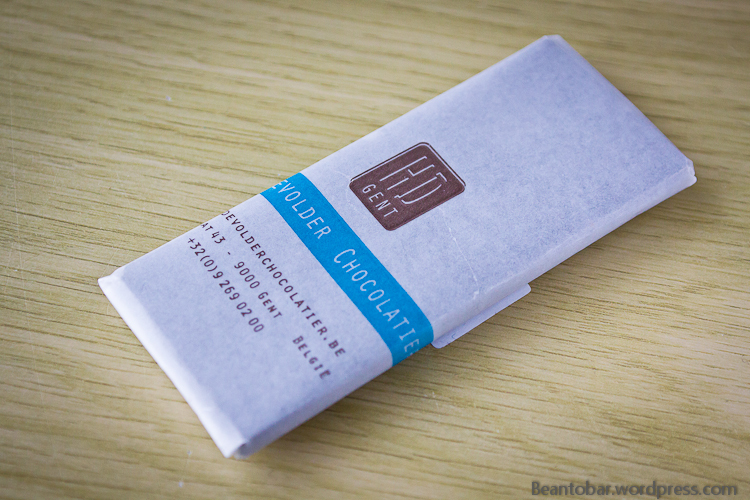 The delicate bar is wrapped in the store in nice wrapper with Hilde’s home-style logo. Opening it revealed an amazing chocolaty aroma, making it hard to resist digging in right away. The bar itself looks like a little tablet with handmade carvings. By far the nicest mold design I’ve seen so far. Made me hesitate to break of a piece as it feels a bit of a shame to ruin the bar. 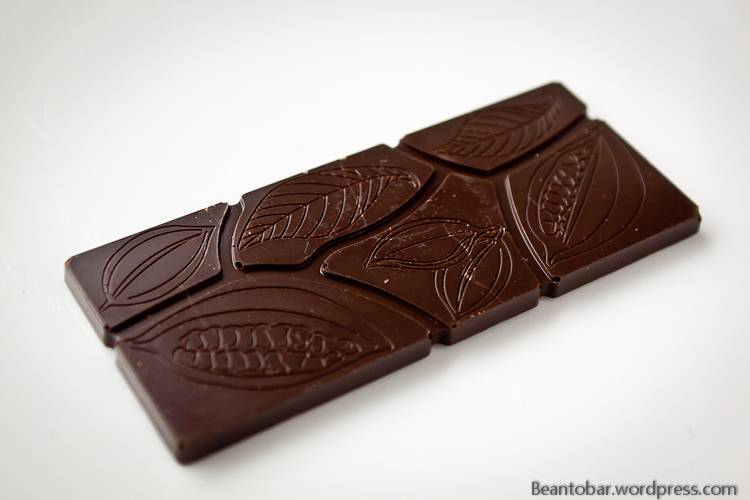 As with many 100% bars, it is less thick than lower percentage bars, because of the intensity of the taste. Colour: incredibly dark and deep. Aroma: a somewhat spicy, tobacco smell combined with cacao and the acidity of a seriously high cacao content. 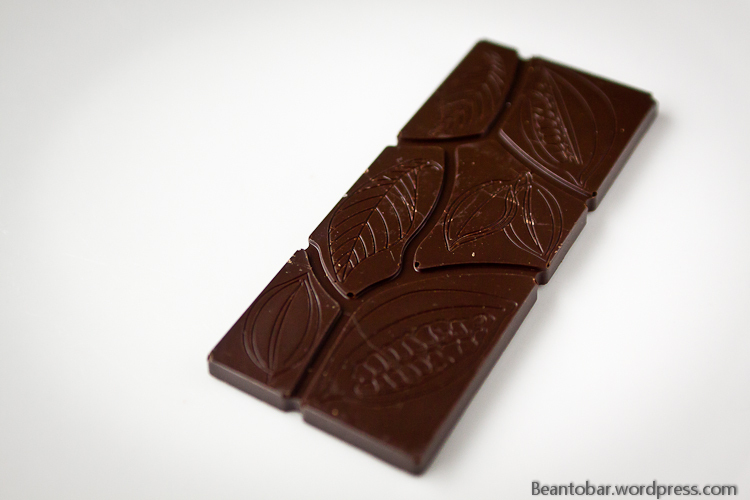 Taste: This chocolate doesn’t veil anything, it states 100% cacao right from the start, with an earthy bite on the tongue. When it subsides, a vibrant cacao comes through, somehow even a bit sweet for a second even without presence of actual sugar, before a wave of acidity and deep, concentrated espresso coffee tones take over. The melt isn’t creamy like the Pralus, wich obviously means Hilde didn’t try to temper the intensity of the cacao by adding to much cacao butter. It feels a little dry in the mouth as it delivers wave after wave of pure cacao bean tastes. It brings along the chestnut flavors I’ve come to expect in 100%, towards the end of the melt, a thing I really became fond of. Once the chestnut has passed, a sweet wave of pure chocolate marks the beginning of the aftertaste, focussing on the cacao with reduced intensity in acidity. And it just keeps ringing away such a long time after the last crumb has molten. To me this is a bar that makes no compromises, and tends more towards Pacari’s “100% raw” than to Pralus’ “Le 100%”. It could startle anyone not used to high percentages, yet thrill those who are already introduced into these fine chocolates. Delicious!